A suspected killer who has been on the run for more than two years has been placed on a worldwide most wanted list. 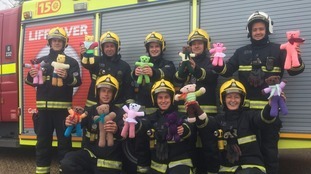 A new scheme called "Trauma Teddies" sees the cuddly toys on board fire engines in Hillingdon to comfort children at distressing scenes. Police confirm a fourth man arrested in the murder investigation of father-of-three Redwan El-Ghaidouni in Hillingdon has been bailed. 60-year-old Bronwyn Davies from Hillingdon has been missing since New Year's Day. She was captured on CCTV walking along the Grand Union Canal in West Drayton that morning, by the John Guest Ltd business premises, but hasn't been seen since. She regularly walks her dogs along this towpath and is well known to other dog walkers and joggers. She has diabetes but doesn't have any insulin with her. ...Mum has been missing since New Year's Day, she has possibly walked to Stockley Park or towards Uxbridge via the Grand Union Canal. People around the canal would know my mum from walking our dog, 'Beth.'"